"Don't try to change the Crucible to fit your needs. Let it change you." Hailed by some as a god, you now seek to understand the secrets of the planet on which you live. This knowledge is held in countless hidden Vaults, which you must find and unlock using keys forged of Æmber, a precious substance that runs throughout the Crucible. To this end, you have gathered a team drawn from three of the Crucible’s seven great Houses. But you are not the only one seeking this knowledge and the power that comes with it—rival Archons across the planet all seek the same goal, and when two Archons meet at a Vault, conflict is inevitable. When two Archons meet in combat, you must be ready to react and learn on the fly, using every tool at your disposal to counter the tricks your rival has up their sleeves. Within each House, you will find four types of cards: actions, artifacts, creatures, and upgrades, based on what these Houses brought from their homeworld or created after arriving on the Crucible. Over a series of turns, you will use these creatures and cards to collect precious Æmber, battle your opponent, and ultimately forge enough keys to unlock the Architects’ Vault! At the start of your turn, you will choose one of the three Houses within your deck and activate it. Once you have declared your active House, you may only play and use cards from that House, so be sure to choose wisely. Though you only can activate one House per turn, you're free to use those cards as you please: no cards have a cost in KeyForge, so you can use your active House to run wild, playing and using cards without limit. At the end of your turn, you will draw back up to a full hand of six cards, so it may be best to play as many cards from your hand as possible. Then again, you may want to hold your best tricks back so you can get their full impact at the opportune moment! And that's just the start of the tactical choices to make in every turn of KeyForge. When you play creatures from your hand, you must build your team outward from the center, playing cards to the left and right of your creatures already on the field. But when you strike, you may attack with any of your creatures, regardless of their placement in your ranks. Once creatures are locked in combat, they match strength against strength, with each side dealing and taking damage. For example, the Staunch Knight, aligned with Radiant Argus the Supreme, attacks Valdr, who follows Miss "Onyx" Censorius, while both are on a flank. The Staunch Knight's power of four, combined with his bonus two power for being on a flank would make him strong enough to end Valdr! Still, Valdr's six power would also be enough to destroy the Staunch Knight in return. 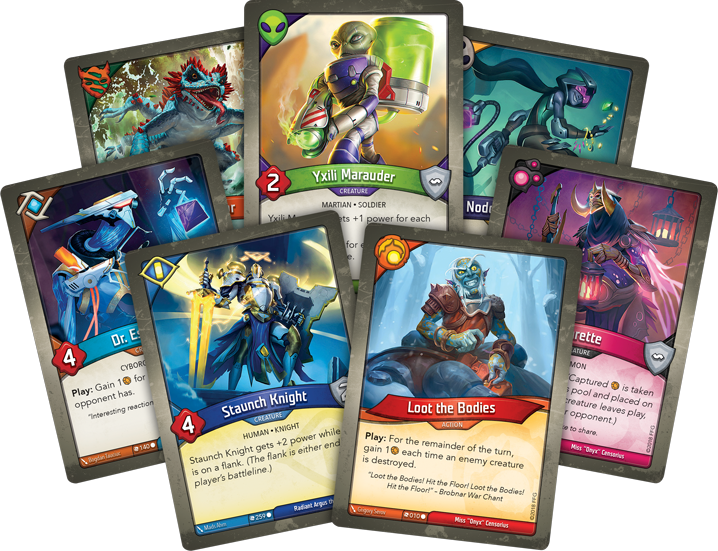 Cards enter and leave play quickly in a game of KeyForge, with your allies entering and leaving play at a moment’s notice. You must choose carefully how and when to use your cards—you never know when your opponent will wipe your creatures away, and you must be ready to come back with a new plan, lest you suffer the agony of defeat. 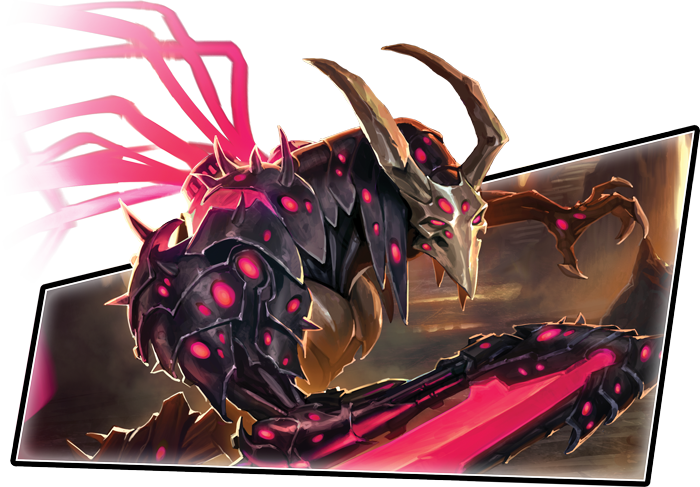 But beyond battle, the heart of KeyForge, the purpose for your Archon's presence, is the Æmber itself. While you must keep your enemy from gaining the advantage, you must take care to never lose sight of your goal: reaping and gathering as much Æmber as you can. While the act of reaping exhausts a creature and prevents it from battling for the turn, it also earns Æmber for your pool. If you have six Æmber collected at the end of your turn, you must declare “Check!” as a warning to your opponent. Then, if your opponent fails to foil your plans and you still have six Æmber at the start of your next turn, you immediately forge a key, moving one step closer to opening the Vault and the knowledge within. The first Archon to forge three keys is the winner! Within each Archon Deck, you will find members of three of the Crucible's great Houses. There are seven Houses to draw from, each with a unique culture, history, and technology that makes them stand out among their peers. The brawlers of Brobnar are a proud, boisterous people who value strength above all. Ruled only by the physically strongest among them, what they love most is a good fight, and each person is only entitled to what they are able to take and protect. The empire of Mars is exceptional has remained mostly unchanged since its relocation to the Crucible. Still ruled by the Elders, they continue their biological experiments to create the perfect monster and fight using ray guns and flying saucers to ensure their culture survives. The angelic knights and crusaders of Sanctum keep their home on the Crucible safe, clean, and pleasant—a rare thing on the planet. Floating on golden wings, these warriors protect the weak, defend the innocent, and destroy all who threaten their order. The scholars of Logos are the self-proclaimed "foremost" intellectuals of the Crucible. Logotarians often replace parts of their bodies with technology, and while some call their experiments deranged, they know that true understanding is worth more than any one life. The demonic creatures of Dis are unmatched in cruelty and sheer ruthless. Dwelling in the deep underground of the Crucible, they incorporate Æmber into their minions to help them gather more of the precious substance and more souls. Shadows is filled with a motley crew of rogues, thieves, con-artists, sometimes-assassins, and general ne'er-do-wells. Known for cleverness and speed, they repurpose what they lift from other Houses to survive. The varied creatures of Untamed reject civilization, choosing to live in the wilds of the Crucible. Built by blending myriad biomes, this House is loosely organized, but all live true to their nature, whatever it may be. What sets KeyForge apart from any other game in the world? 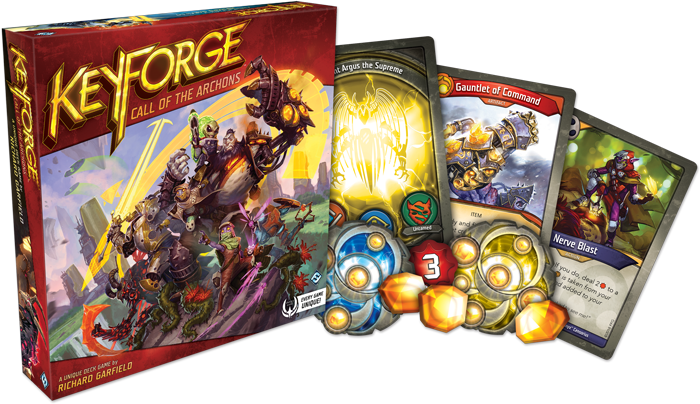 KeyForge is the first of a new breed of game from Fantasy Flight Games—the Unique Game, and specifically, a Unique Deck Game. Unique Games can take many forms, but what this means for KeyForge is that every deck in existence is utterly unique and different from every other deck. There is no drafting, deckbuilding, or boosters; every Archon Deck is complete and cannot be changed. This is part of the challenge—using only the tools at your disposal, you must best your opponent in a game of tactics. Power does not come from a single card, but rather in how the cards within a deck play off one another, just like how a team is defined by how players interact rather than by a single star. 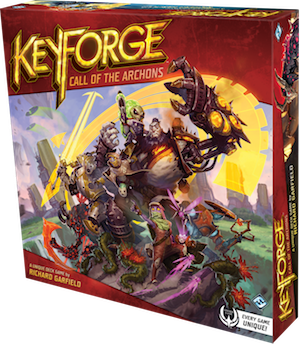 You begin your adventures with the KeyForge: Call of the Archons Starter Set, which includes everything two players need to throw themselves into the world of the Crucible. As you can see above, you'll find tokens, two starter decks (the only fixed, standardized decks in the game), and two Archon Decks that remain a mystery to the world until you open them up and peer inside. Once you have mastered the KeyForge: Call of the Archons Starter Set, the next step is to expand your collection of unique Archon Decks. These decks each offer a full play experience, complete with a distinct name, Archon design, and scan code that allows you to track your deck in the KeyForge companion app and website. Here, you can follow both your decks and those of other players, finding your place in the meta at large. You can also easily find tournaments and follow the game’s Organized Play to bring you closer to the community, as diverse as the Crucible itself! A single Archon Deck unites cards from three of the Crucible's Houses, creating combinations and strategies that only you can discover and harness. A new world of limitless possibilities stands before you, filled with ancient secrets and newfound friends. How you will help shape this planet and find your place among its many inhabitants is up to you. Are you ready to embrace new challenges and explore a world beyond anything you have come to expect? Gather your allies and prepare for a new adventure in a new world! Is KeyForge a collectible game? KeyForge is an entirely new kind of game called a Unique Game. Specifically, it’s a Unique Deck Game. Archon Decks aren’t randomized booster packs like a collectible game and they’re not fixed-distribution card packs like a Living Card Game®, although you’ll most likely want more than one Archon Deck. Each deck offers an entirely self-contained experience and chance for discovery with a unique mix of cards from three of the game’s Houses, and they can be played right off the shelf with no deckbuilding necessary. Every Archon Deck is different from every other deck in existence, giving you the chance to find something completely new in every deck, and with billions and billions possible decks in just the Call of the Archons set for KeyForge, there’s just no way you could collect them all! Unique Games are an entirely new type of game from Fantasy Flight Games! They can take many different forms, but they share one thing in common—every copy of the game is unique. The copy that you pick up off the shelf will have different components than the copy your friend gets at their store. Unlike Legacy Games, which start with identical components and become unique through gameplay, Unique Games have their own distinct mix of components in every box. What makes a KeyForge deck unique? In KeyForge, the game centers on your Archon Decks. Each deck invites you to embody one of the countless Archons of the Crucible, taking control of that Archon’s followers and using their unique companions to claim victory. In practice this means a couple of different things. Of course, every Archon Deck offers a completely unique mix of cards, drawn from three of the Houses within the game. This unique mix of cards means that every deck has strategies and combinations that only you can discover and harness. The differences have an aesthetic nature as well! Every Archon Deck has its own title and unique card back, displaying the figure of your Archon and helping you easily identify the cards of your Archon Deck. 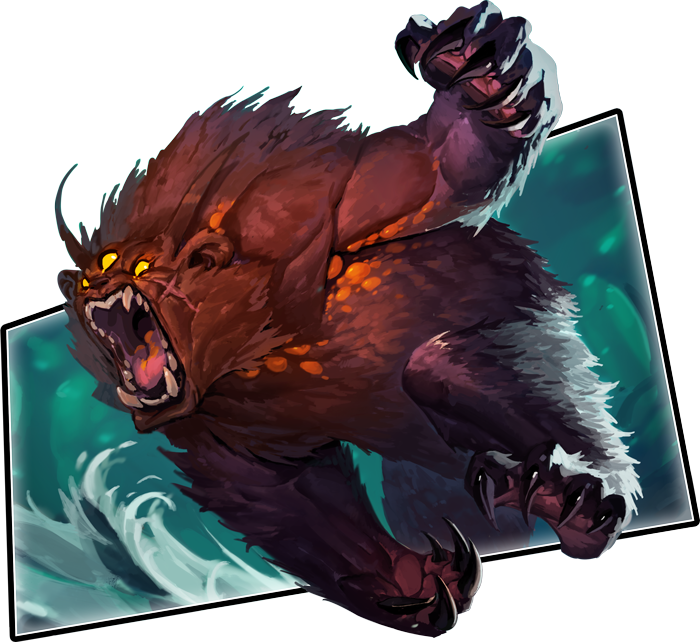 Can I build decks in KeyForge? Every Archon Deck comes ready to play, without the need for deckbuilding or booster packs. 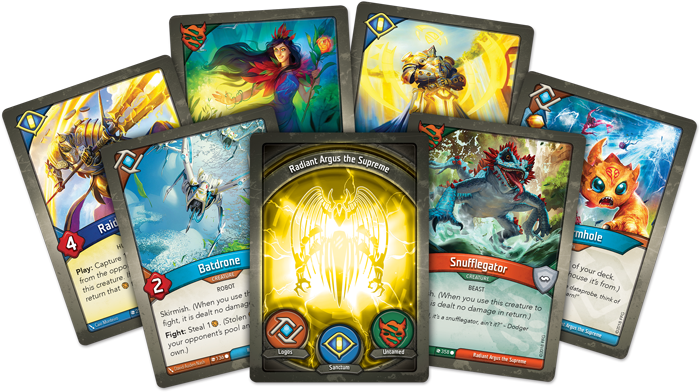 The unique nature of each deck is part of what sets KeyForge apart from other games! It’s not the cards themselves that are powerful, it’s the combinations that exist in only your decks that make them special. Are some decks stronger than others? What happens when a deck wins consistently? 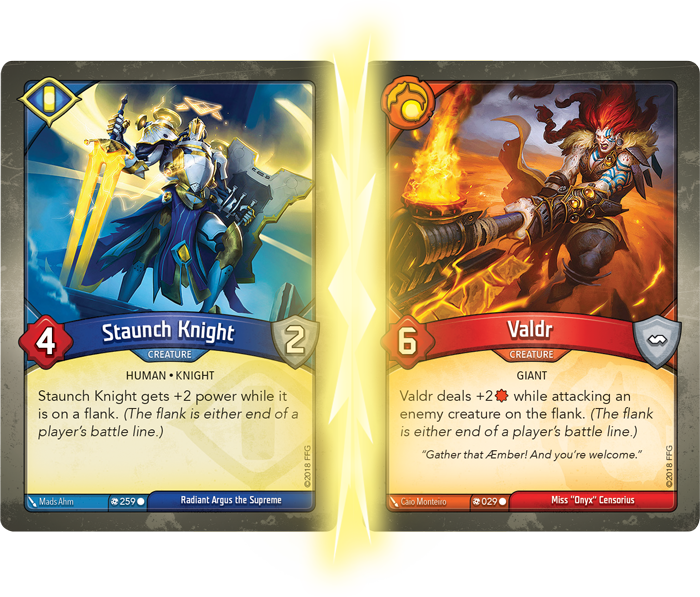 Some Archon Decks in KeyForge will naturally be stronger than others, but every deck in KeyForge has value. First of all, every deck represents a chance to explore deeper into the world of the Crucible, potentially uncovering cards and combos that you never knew existed or have never played with before. Furthermore, just like any card game, some decks are better in certain matchups, and choosing the decks you’ll play is an important strategic element. And even if you and your opponent have decks that are less than optimal, it can be just as fun to swap decks and see what your opponent can do with your deck! If a deck wins too often in an Organized Play framework, there are processes in place to handicap and eventually retire that deck. For more information on this, keep watching our Organized Play articles and announcements for KeyForge! 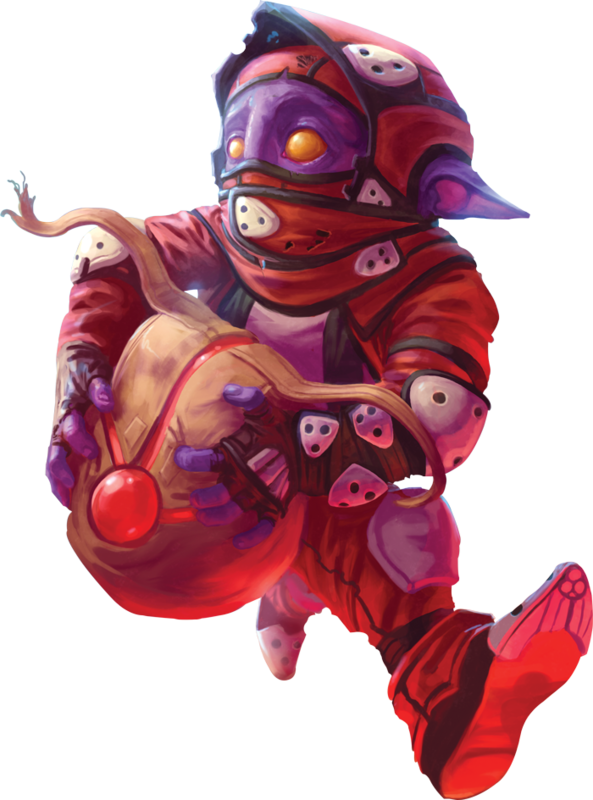 Will there be Organized Play for KeyForge? Well, we kind of gave it away in the last paragraph...Yes, there will be Organized Play for KeyForge! 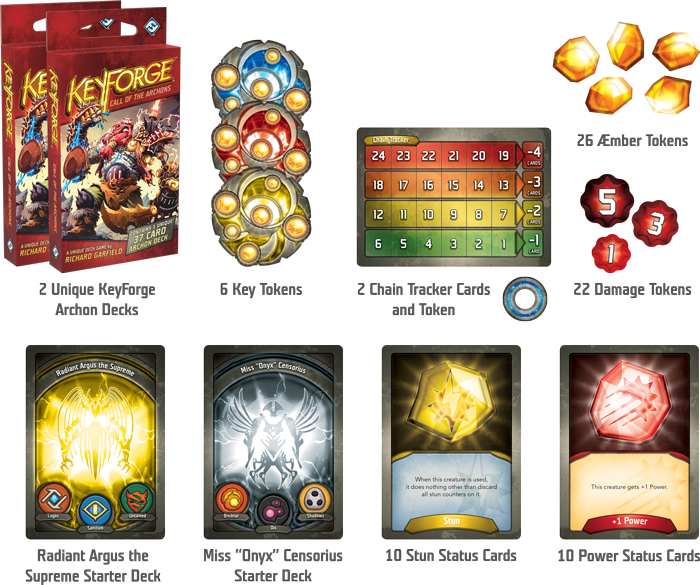 Stay tuned to our website for more information on KeyForge Organized Play. What does the KeyForge companion app do? 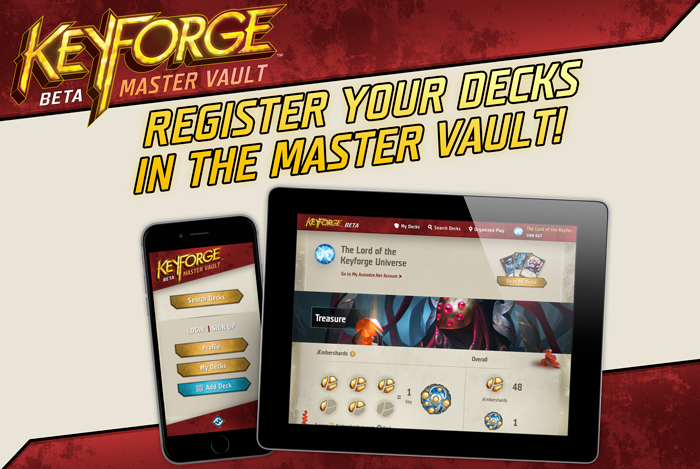 KeyForge will also feature a companion app and website at KeyForgeGame.com, which will go live at the game’s release. Here, you’ll be able to record and track your unique Archon Decks, watch the meta at large, and easily find tournaments. By incorporating this technology into your experience of the game, you can engage and interact with both the game and its community on an unprecedented level.